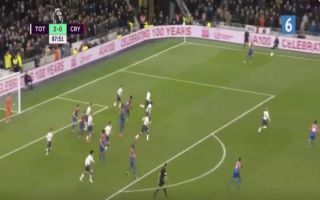 Christian Eriksen showed off his superb technical ability and vision during Tottenham’s win over Crystal Palace on Wednesday night. The Lilywhites secured a much needed 2-0 victory over the Eagles at their brand new Tottenham Hotspur Stadium in the Premier League last night, which saw them move back to third in the table. Goals from Son Heung-Min and Eriksen ensured that Mauricio Pochettino’s men earned three points in their first match at the luxury 62,000 capacity venue, as they continue to chase a place in next season’s Champions League. In addition to his goal, Eriksen’s outstanding first touch and perfectly executed karate kick pass to Son late in the game gave the home supporters extra reason to cheer and highlighted just how important he is to this Spurs team.
? @ChrisEriksen8 has been directly involved in 100% of the Premier League goals scored at our new home! ? Check out a video of the Danish superstar in full flow below, via Twitter.